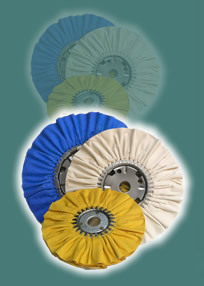 National Buff Co, Inc. has been a leader in buffing products since 1995. We specialize in products for the polishing and plating industry. We carry over 150 different types of products. Please browse our products section of the website to view the dozens of categories and products we offer. For additional information or to place an order, click on the contact page for information via telephone, fax or email. Our products are made from high-quality materials, and are manufactured with a high level of craftsmanship. With specially-treated cloths, and materials. National Buff products will yield the best results when you are looking for a high-end polished finish. 2005© Copyright National Buff Co., Inc. All rights reserved.